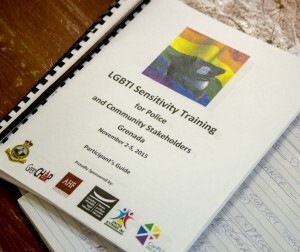 LGBTI (Lesbian, Gay, Bisexual, Trans, and Intersex) awareness training for police and other community stakeholders was held at the Special Services Unit (SSU) Camp at Point Salines, from 2 to 5 November, 2015. The awareness building exercise was supported by the Royal Grenada Police Force, Canadian HIV/AIDS Legal Network, AIDS Healthcare Foundation, GrenCHAP, United & Strong, and CariFLAGS. 42 uniformed officers from the police, immigration, fire, customs, prisons, and ports services were joined by 8 civil society representatives from the Grenada Planned Parenthood Association, Grenada Human Rights Organisation, GrenCHAP, and its sister group United and Strong (St Lucia). This innovative programme was first brought to the Caribbean by AIDS-Free World and has so far been delivered in Suriname, Barbados, St Lucia, and St Kitts. Modules on community policing, human rights, professionalism, ethics, an introduction to LGBTI issues, and how to police hate crimes were delivered in 2 sessions of 2 days each. The small size of each group (no more than 25 persons) allowed for frank discussions on the very challenging but critical issues. The course curriculum was written by Thomas Decker who served as the LGBTI liaison officer for the Toronto Police Service. Tom’s partner, Maurice Tomlinson, who is a Jamaican lawyer, LGBTI and HIV activist, and senior policy analyst with the Canadian HIV/AIDS Legal Network, also contributed to the human rights and Caribbean-specific sections of the training. Decker and Tomlinson served as training facilitators for the course. Day 2 of the training in Grenada was difficult for most participants because that was when they were introduced (some for the first time) to specific LGBTI issues. At the end of the sessions most participants expressed that there was need for more than 2 days for these exercises. While some participants expressed stereotypical views against the human rights of homosexuals, there were also several moments of growth and personal learning. For example, there was the realization by the left-handed attendees that they too were once stigmatized and abused for who they are because of religious doctrine. Participants with LGBTI family members also shared their fears for the security of their family in Grenada. While Grenada is not known for a high number of anti-gay attacks, members of GrenCHAP who were in attendance revealed that they have received reports of homophobic discrimination in employment, housing and healthcare as well as verbal and physical assaults. However, the level of homophobia and unfamiliarity with the system of reporting abuse discourage persons experience victimization from coming forward to the police.